Four bodies and 357 migrants reached the Spanish coast this weekend on 11 small boats. The deaths add to the 239 who have died just this year during the Mediterranean Sea crossing into Spain, according to the International Organization for Migration (IOM). Late yesterday evening, a Maritime Rescue team located one small boat with 14 migrants – all women – who landed on the Chafarinas Islands. In May, around 3,400 migrants reached the Andalusian coast. They raise their arms to the sky and yell “iboza,” meaning victory in the Fula language. On the turbulent Alborán Sea, 49 people from Sub-Saharan Africa, two of them women, have just been rescued. Two passengers traveling on the ferry between Melilla, a Spanish exclave city on the north coast of Africa, and the Spanish peninsula record the emotional scene. “It breaks my heart,” says one of them, moved by the migrants’ cheers of joy. But amid the cheers there is a sign of tragedy – a cross in honor of the four men who did not make it. According to the IOM’s Missing Migrant project, just this year 239 people have died trying to cross the Mediterranean Sea into Spain – 15 more than the death toll for all of 2017. Police have opened an investigation into the death of the four Sub-Saharan men but first signs indicate drowning. All the migrants who arrived this weekend were from Sub-Saharan Africa. Those rescued included 11 minors and 18 women – one of them pregnant. A small boat carrying 14 Sub-Saharan women made it on Sunday morning to the Chafarinas Islands, a Spanish archipelago located 27 miles from Melilla and 1.9 miles from Morocco. Most of the women were adults, according to Melilla authorities. The General Commander of Melilla will now decide whether the women will be moved to the city or, as has happened with boats of men, sent back to Morocco. In addition to the 126 migrants who arrived on Sunday, 231 more were rescued on Saturday from six small boats, raising the number of this weekend’s arrivals to 357. Some 3,400 migrants landed on the Andalusian coast just in May. By the end of the month, the number of migrants processed was 7,376 – 92% up on the year before. The endless stream of arrivals is stretching services to the limit. 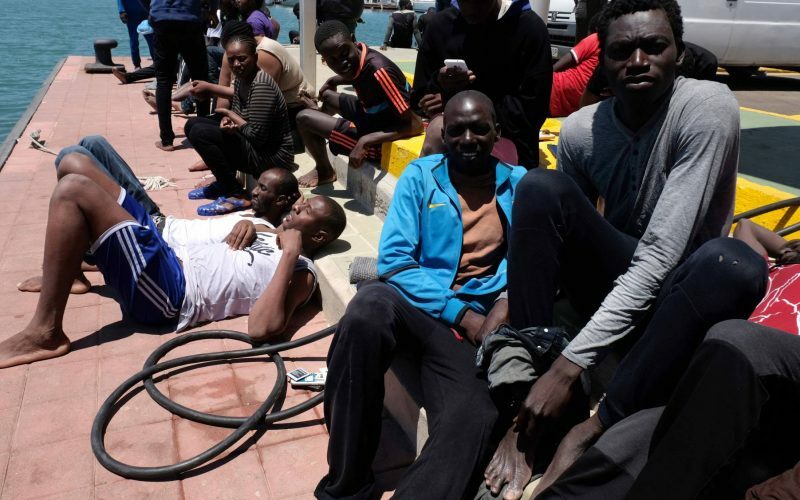 When 600 migrants were rescued on May 26 and 27, Foreigner Detention Centers (CIE) and police detention cells in Cádiz and Granada were unable to deal with the unexpected surge. The CIE centers in Algeciras and Tarifa – with space for 30 and 60 detainees, respectively – are being used to hold migrants from Maghreb before they are sent back to the region, in accordance to current agreements. But migrants from Sub-Saharan Africa receive different treatment. After spending a maximum of 72 hours in police detention, they are let go and normally helped by a non-for-profit such as the Red Cross. But with the 600 migrants to attend to from May, these organizations do not have the resources to care for any more. Despite this, the Interior Ministry is letting migrants fend for themselves. This sloppy arrangement, where migrants are sometimes released in the middle of the night, has forced local authorities in cities like El Puerto de Santa María, Jerez and Cádiz to improvise emergency plans. These operations are on hold until the next surge of migrants arrives in the province. When that happens, the Elanco Nautical Center in the capital is expected to provide care and provisional shelter for the migrants. Meanwhile, the region’s police force warn they have not made any preparations for the ongoing arrivals even though Intelligence reports warned the number of migrant arrivals would “double” 2017 figures.